Can an unborn baby really send stem cells to repair its mother’s organs? Scientists think there’s an evolutionary mechanism whereby the baby assists in protecting the mother’s heart during and after pregnancy. 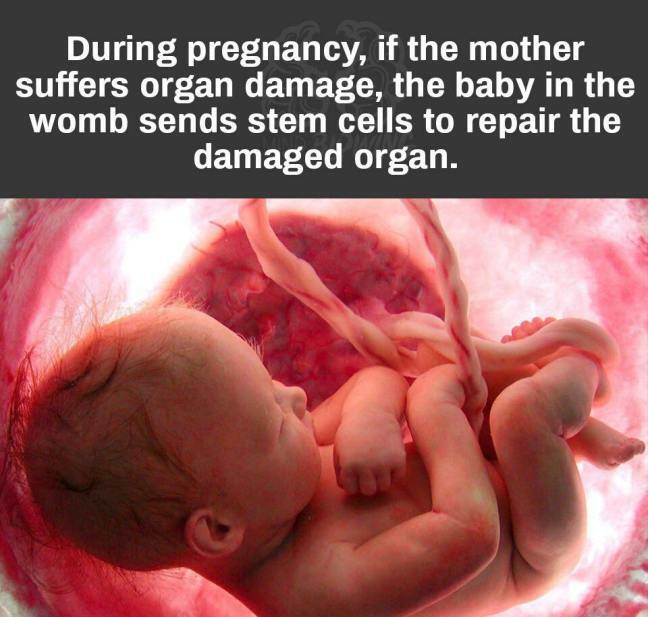 This popular meme suggests that an unborn baby can send its own stem cells to its mother to repair damaged organs. Memes are not always known for their scientific accuracy, so what’s the truth behind this one? Snopes.com, a website covering urban legends, internet rumors, e-mail forwards, and other stories of unknown or questionable origin, set out to investigate the claim this meme makes–that during pregnancy, if the mother suffers organ damage, the baby in her womb sends stem cells to repair the damaged organ. The transfer and incorporation of fetal stem cells into a mother’s organs is referred to as fetomaternal microchimerism, and scientists have been generally aware of it for decades. A 1996 study in Proceedings of the National Academy of Sciences, for example, found that in humans, genetically distinct cells from a male fetus persisted in the mother’s body as long as 27 years after birth. A 2015 study published in the journal Circulation Research addressed the issue of fetal stem cells actually healing maternal organs. In this study, researchers tagged mice with a fluorescent protein that allowed the researchers to trace the flow of the fetus’s stem cells from the mother’s placenta into its heart while they induced cardiac injury to the mother. They found that fetal stem cells directly targeted the damaged cardiac cells and fully integrated themselves into the mother’s heart. It seemed that fetal cells sensed precise signals that allowed them to target the specific injured area. The authors said they had potentially uncovered “an evolutionary mechanism whereby the fetus assists in protecting the mother’s heart during and after pregnancy.” There is a wide body of research that suggests similar phenomena could occur in humans. So, an amazing pro-life fact you can share with confidence!